The memory keeper in me won't keep quiet. I have been thinking a lot about memory keeping lately. I always find a way to take photos, make a blog post or even write something in my journal. I just don't want life to pass me by without some kind of recognition or without me noticing. So naturally I want to make the time to document my Eid celebration this year. I know it will not be the same without my mother and I don't know if I can be happy. Nevertheless I am going to make it my personal mission to find the good and the joy in every thing. Consciously making an effort to smile and be happy. As always during this festive season we gather together with our big, extended family which we seldom meet. This is the perfect time to catch up, take photos and be happy together. Try to get a few shoots of family interact with each other, the expression of their faces and the family member. Clothing has become one of the things that are going to be new and colorful during Eid. Taking photos of that can really be a gem in the long run. Food is also one of the main thing people focus on this day. Don't foget to take what food is on the table that day. Going macro is going to be more fun and meaningful too. Document the little things about your morning routine like things you do, things you say, food that you eat, and many more. This mundane routine can be a treasury in the year to come. What you are thankful for and all the things related to it. I alway reinventing myself and changing up my style. I am sure are going to take lots of photo that showcase my look. I would probably take a few photos of my new makeup that I have purchased for Eid. If you have kids in the house, don't forget to capture that. #8. Screen capture Eid wishes that you received on your phone. In this age we received a lot of Eid card wishes on our phone. It will be ashamed not to try and document them. It's part of the lifestyle right now. You are unique in so many ways. I'm sure ten years from now you will look back to Eid 2015 and say to yourself I was here and I had a great life! It's also a chance for you to leave your legacy in your own word. #10. What makes this Eid different than the previous year? I learned this the hard way. I took for granted for what I had with me for so long that I don't even make the time to properly document them. Now that my mother is gone, I kinda feel the lost. I have so many questions that left unanswered like how does she makes Peanut butter cookies that taste so yummy. How does she makes rendang daging that was so juicy and tender? So this year I am not going to let these small details left unnoticed. I might take my planner with me or I might not. 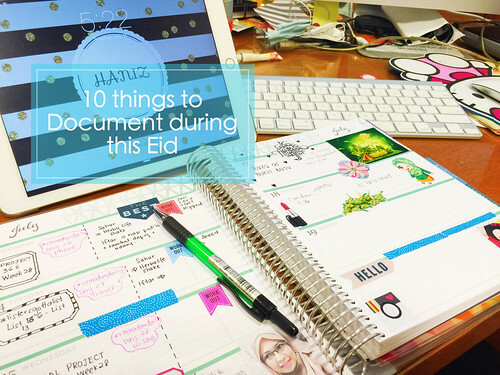 But one thing is for sure I am going to write down something about this Eid what makes it different.